My name is John McDougall and my Amateur Radio call sign is K7JM. I hold an Amateur Extra class license. I have a lovely wife named Carol, and we have a bunch of great kids. We all love Jesus, and He is Lord of our lives. I thank Him for this great hobby that He has given me. Here is a little bit of history about how I got my licenses and when. Enjoy! 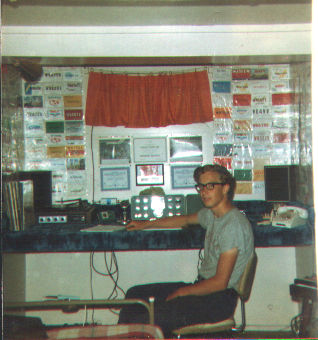 I took a Ham Radio class back in 1973 when I was in the 8th grade The class was taught by Joyce, K7RRS. My brother signed up for it, he was in the 7th grade. My mother suggested I take the class, and kind of pushed me into it. THANK YOU MOM! There were four of us that ended up getting our tickets. I took my Novice CW test on Mar. 18, 1973 and the written on April 10. Click on the picture to the left to take a look at the CW test. I don’t recall why I took each part on different dates; perhaps the CW portion had to be passed before the written could be sent to the examiner. Back then, everything was done with snail-mail and the FCC was in no hurry. I received a notice that I passed the written on April 10, 1973 and finally received my ticket (license) on May 4, 1973. It took nearly a month from the time I took the written test until I received the license. 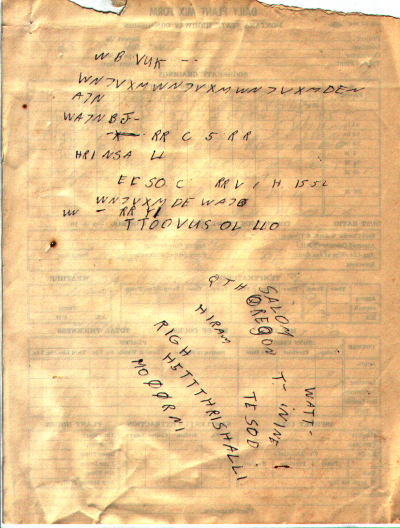 This was very typical in those days and we could not operate until we had that piece of paper in our hand. Click on the picture to the left to see my novice station. 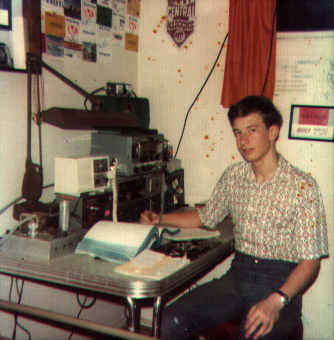 At the time of this picture, I had a borrowed transmitter with a VFO and a borrowed receiver. I don’t recall the brands. If you look closely, on the right side of the equipment on the bottom, sits my homebrew crystal controlled transmitter. I had one crystal for 80 meters and could not work anyone other than local hams. 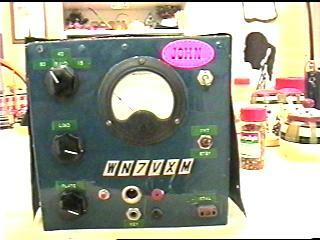 Click on this picture to see a fuzzy picture of that homebrew transmitter that still graces my shack. After more than three months, I obtained a crystal for 40 meters and finally got my first contact out of the area. Click this picture to see the actual contact with WA7NBJ from Salem, OR. I was so nervous I could hardly function. What a rush. If you are waiting for your CW to get perfect before you can contact someone, think again. It is possible, and it is fun and exciting. Back in those days, the novice license was only good for two years; and it was not renewable. Now, that was incentive to upgrade! 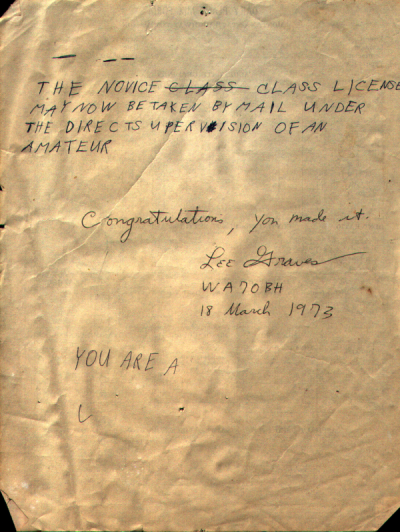 I took my general test on Jan. 27, 1975 and finally received the license for WA7VXM on Mar. 24. I built up a nice station consisting of a Heathkit SB-102 and accessories. Click the picture to the left to take a look. This was a very nice station for the mid 70’s. I finally passed my Advanced class license and received the license on Feb. 2, 1976 and got my Amateur Extra class on June 10, 1982. It took several years and several tries to achieve this. If you happen to be one who has taken a test and failed, try, try again. I did, and it was worth it. For a short period in the early 80’s, the FCC allowed hams to pick a call if it was not taken. I chose, and received K7JM, the call I have now. This is not part of the vanity call system, as this one did not cost money, and I don’t have to re-pay for it in the future. Now, back to the present, I am much older, have a wonderful wife and great kids. 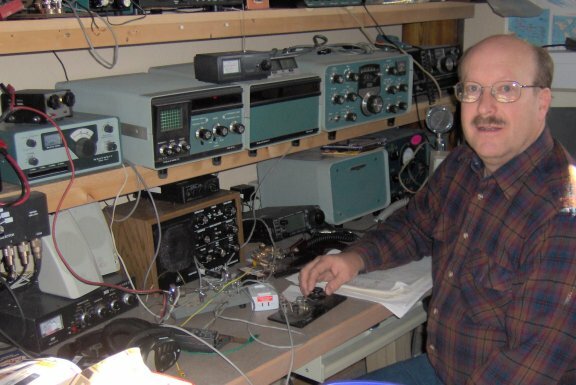 The hair is all but gone; but the excitement of Ham Radio lives on. Click this picture to see my current setup. I still have that good ole’ Heathkit SB-102 station. And if you look closely, to the right, on the bottom, with the pink sticker, there is my old homebrew crystal controlled tube transmitter. I recently restored it, and it actually works still. I have made contacts recently with my Heath gear and it is a lot of fun firing them up now and then. My current “new” transceiver is an Icom IC706MKIIG. It’s a nice little transceiver that does a lot that my large old Heathkit doesn’t do, but it sure doesn’t sound as sweet or warm up the shack like the tube loaded Heathkit does. I operate almost exclusively CW, as I just think it’s fun. I also dabble around with PSK31 and occasionally SSB. I love to build stuff and I tinker a lot on my workbench. If you have any comments, give me an e-mail at the address show below.